The evil queen stakes just got higher in the prequel to Snow White and the Huntsman, Huntsman: Winter War which is directed by French visual effects supervisor turned director Cedric Nicolas-Troyan. His previous visual effects credits include Pirates of the Caribbean: Dead Man’s Chest, Snow White and the Huntsman and Solstice. 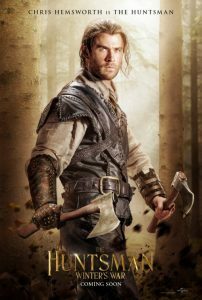 Australian actor Chris Hemsworth returns as Erik the Huntsman along with South African Oscar winner Charlize Theron (Monster, Mad Max: Fury Road) as the vicious queen Ravenna. New to the cast are Jessica Chastain (Zero Dark Thirty, Interstellar) as Erik’s estranged wife Sara and an equally evil queen, Ravenna’s sister the Ice Queen Freya wonderfully played by Emily Blunt (The Devil Wears Prada, Into the Woods). 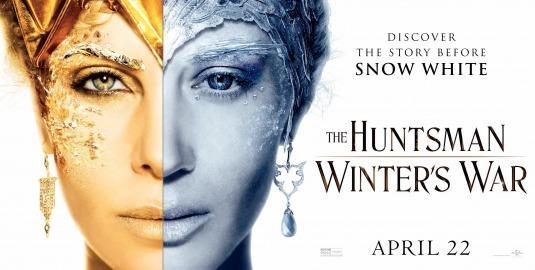 Interestingly this is a female action film and that’s why Huntsman: Winters War works so well although it’s not as good as the original 2012 Rupert Sanders film Snow White and the Huntsman. Visually, Huntsman is quite dazzling especially in the second half of the film, and director Cedric Nicholas-Troyan makes full use of all the latest CGI available especially when the gorgeous Ravenna emerges out of the illustrious gold mirror looking fabulous. In actual fact Ravenna’s outfit, which Charlize Theron naturally uses to its full potential is sure to inspire many a drag queen in the future, wonderfully emboldened with beautiful eye make-up and a fabulous gold head dress to match, a rival to Angelina Jolie’s outfits in Maleficent. Simply gorgeous. Who cares if she is an evil queen, when she looks so stunning! Jessica Chastain is suitably bold and kickass as Erik’s opinionated wife who manages to save his life from a collection of hideous goblins which looked as if they escaped from the set of Pan’s Labyrinth. Emily Blunt is wonderful as Ravenna’s younger sister Queen Freya whose heart has been turned to ice by the sudden and inexplicable death of her baby daughter who she naturally blames her husband for. Audiences should watch out for British comedian Nick Frost as a smart-mouthed dwarf Nion and Alexandra Roach as Doreena last seen in Cuban Fury and The Iron Lady as well as Sam Claflin as William, Freya’s doomed husband. 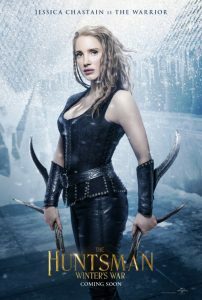 Whilst Huntsman: Winters War is wonderful to watch, the dialogue could have been better written, yet the story is pure escapism, fantasy with a large dose of femme fatale and a couple Erik and Sara who eventually put aside their differences to defeat the evil sisters who are entirely without mercy and vicious to the core. 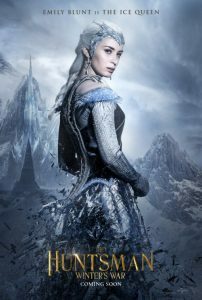 Huntsman: Winters War is recommended viewing for those that enjoyed Snow White and the Huntsman and should look forward to the third instalment in a film series which was clearly designed to be part of a fantasy trilogy.